The text which you type to search will come as request parameter “term”. In above code, assume that i am getting the datatable from the database which contains the username and his email id. the return type of the handler is “application/json” which indicates that it is returning JSON object in response. In this section we will create a usercontrol in our project. /// Gets or sets a value indicating whether this instance is multi line. /// 	<c>true</c> if this instance is multi line; otherwise, <c>false</c>. In above code, at code behind, we have exposed one property named “isMultiline”, which will decide that our Autocomplete User picker control is multiline supported or not. Now, add this usercontrol anywhere in ASP.net page, it will just run with ultimate speed and UI. Download Complete Working project of Ajax based Multiselect JQuery Autocomplete control in ASP.net. This attachment contains advanced control than explained in this article. It has one UserPicker Window also where user can be selected in Bulk. Please share your comments and enhancement if needed. thanks for this post about ajax & juery. 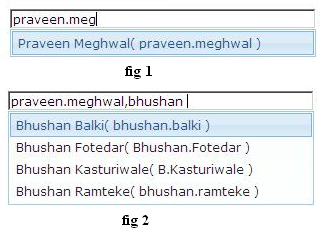 I have downloaded the demo sample and changed the database connections.It is fetching the data while i am key in text box but those values are not displaying in the extender control.I only changed database connections and query.I am not able to figure out what is the problem.Please let me know what is the problem i am facing?My browser is IE 6. I have not tested my application in IE 6, however i have few suggestions. Don’t fetch data from Database, instead try to create dummy list of emp and on line no 53 of “UsersList.ashx” serialize that, and check if it is running. “e.value” should be email id and “e.label” should be the name of the person. and if it does not work then try to add the “DOCTYPE” at the beginning of ASP.Net page. If this does not work then let me know. Why don’t you use ScriptService, ScriptMethod? You will be then able set up better security about exposing Web Services. Thanks for your comment. Here, i wanted to demonstrate the use of JQuery to call the ASP.Net handlers. There was no need of security and i wanted very light weight control. I have used Ajax manager provided by the ASP.Net, but it was very heavy and if i added 4-5 instances on same page then it was not responding. If you can provide me some good tutorial on ScriptService and ScriptMethod, then it will be much appreciated.